As we’ve pointed out in previous posts (most notably here), a return to profitability for producers in light of lower commodity prices will require a combination of three scenarios: 1) variable costs moderate through eventual reduction in farmer demand for inputs 2) fixed costs decline through reduction in fixed asset demand and values, and/or 3) output prices may improve. About a year ago we noted that fixed expenses were still increasing, but at much slower rate. This week we take an updated look at fixed expenses to evaluate if producers have adjusted their cost structure lower. To learn more about producers’ cost structure we turned to the latest Kansas Farm Management Association (KFMA) data. Before evaluating these data, a couple caveats need to be shared. First, these data are farm-level and include a diverse range of enterprises, including crop and livestock production. Second, 2015 was financially difficult for Kansas producers. Average farm income – across all KFMA operations – was only $4,568; a significant decline from more than $128,000 in 2014. Several headlines capturing the story noted 2015 farm income was the lowest in 30 years. Not only was net farm income low on average, 44% of KFMA producers reported negative net farm income. In short, financial conditions in 2015 were difficult for producers in the KFMA and, as a result, the changes in fixed cost structure could be viewed as extreme. An often large fixed expense for farms is depreciation. In 2015, depreciation expense for KFMA farms was nearly $64,000 (figure 1) and represented almost 13% of total farm expenses. Depreciation expense was up slightly over 2014 levels, or 2.5% higher. Depreciation expense is extremely hard to reduce over time as much of the expense is a result of previous year’s decisions. As an example, the depreciation expense in 2015 was likely heavily impacted by purchases – such as combines, tractors, and barns – made in earlier years when farm income was much higher. These prior-year decisions can heavily weight a given year’s depreciation expense. Even though average farm depreciation expense increased in 2015, it’s important to note that the rate of increase is much lower than the 11% and 7% increases observed in 2013 and 2014 (Figure 2). Depreciation expense, in other words, is increasing but at a much slower rate. A second large farm expense is family living. In 2015 average family living expenses was $69,956, or 14% of total farm expenses. After several consecutive years of increase (figure 1), family living posted a 6% contraction in 2015 (figure 2), down from $74,400 in 2014. From 2010 through 2015, family living expense increased at an average annual rate of $2,300 per year. A third important fixed expense is machinery. Machinery costs – which include fuel, repairs, and deprecation – is shown in figure 3 in units of ‘cost per crop acre’. Machinery costs in 2015 were $95 per acre, 4% lower when compared to $99 per acre in 2014 (figure 2 and 3). Machinery costs exploded in 2014, jumping $12 per acre, or 13.8% higher than 2013 levels. On average, machinery costs increased at a rate of $4.77 per acre per year from 2010 to 2015. Earlier, Brent took an in-depth look at farm machinery investment and expense (here). Figure 2. 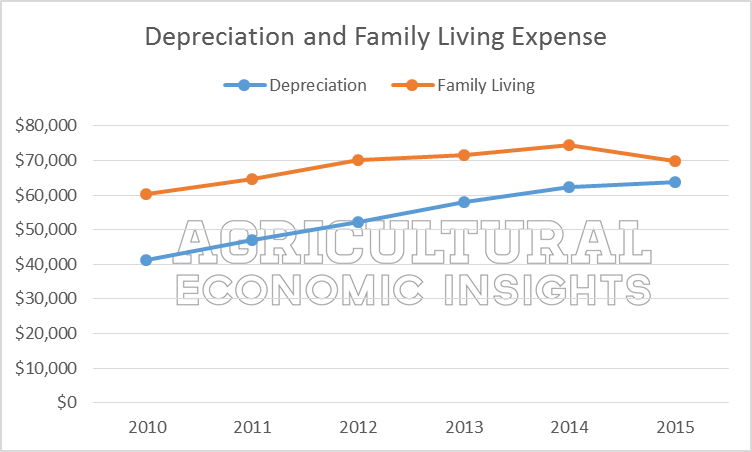 Annual Change in Deprecation, Family Living, and Machinery Cost (per acre), 2010-2015. Data Source: Kansas Farm Management Association. Figure 3. 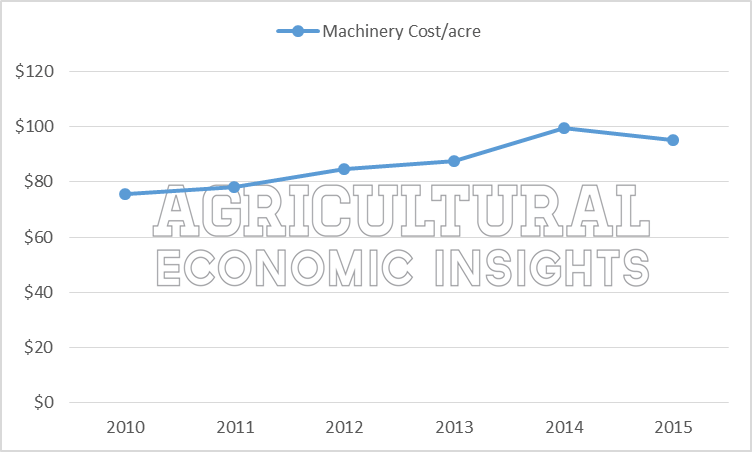 Machinery cost per crop acre, 2010-2015. Data Sources: Kansas Farm Management Association. At the national-level the USDA’s ERS provides commodity-specific cost of production estimates. These data are different from the Kansas data- which evaluates conditions at the whole-farm level – but still provide insights. In figure 4 the cost of production for corn in the U.S. is shown broken down into variable expenses (operating costs) and fixed expenses (allocated overhead). In 2015 the variable expenses decreased by 6% from 2014 levels; fixed expense, however, increased by nearly 3%. So while variable expense for corn production in the U.S. have contracted, fixed expenses have not reduced. Driven by lower variable expenses, the USDA’s estimated cost of production for corn was $13 per acre (or 2%) lower in 2015. 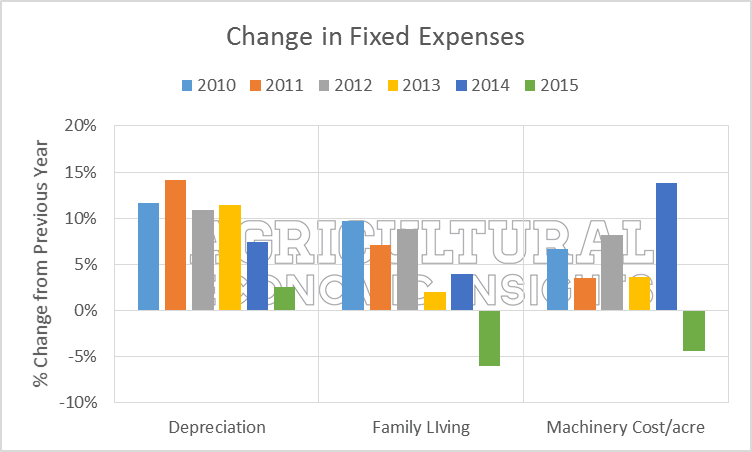 Perhaps most noteworthy is that in 2015 fixed expenses ($342 per acre) exceeds variable expenses ($335 per acre) for the first time since in 6 years. From 2010 to 2014, variable expenses were, on average, $36 per acre higher than fixed expenses. This relationship will be an important trend to monitor moving forward. Figure 4. 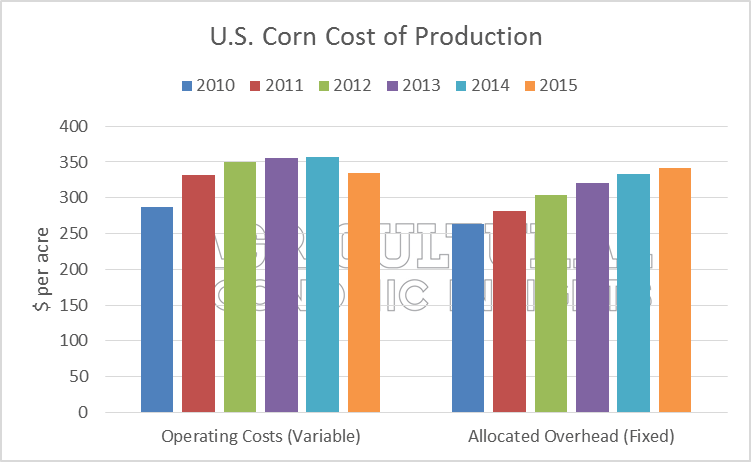 Operating Costs (variable) and Allocated Overhead Costs (fixed) of Production for Corn in the U.S.; 2010-2015. Data Source: USDA ERS. A lower cost structure is a critical for producers adjusting to lower commodity prices. Lowering expenses can be difficult, especially in the short-run. However there are a few early signs that fixed expenses have started lower. Data from the Kansas Farm Management Association reported that producers were able to trim their family living and machinery costs (per crop acre) in 2015. Depreciation expense was higher in 2015, but grew at the smallest rate (2.5%) since 2010. At the national level, however, reductions in corn production expenses were only observed for variable expense. Given the extreme drop in farm income reported in Kansas for 2015, it isn’t surprising that the first-signs of producers reducing fixed expense were observed here. It’s important to note that while it’s advantageous, and likely necessary, for the farm-business to reduced fixed expenses, reductions in family living expense are directly borne by the farm-family. The reality of cutting farm family living expense is not enjoyable and often reflects personal adjustments and trade-offs. While the adjustment in 2015 was not large on average (-6%), the average can be deceiving as some Kansas family farms likely faced large very large reductions in family living expense in 2015. In summary, adjustments to fixed farm expenses are coming; albeit at a slow rate.